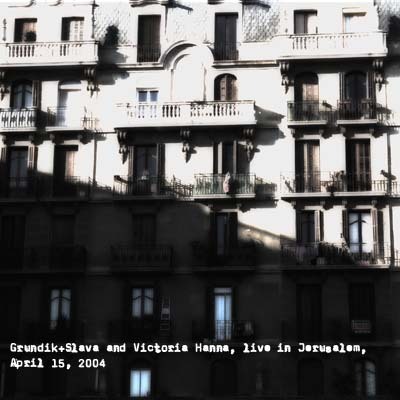 Kunstkamera, KUNS0001, "Grundik+Slava and Victoria Hanna, live in Jerusalem, April 15, 2004"
Это наш давний концерт в Иерусалиме с Викой Ханой. Давняя, но во многом знаковая для меня вещь. Grundik and Slava present online archive "Kunstkamera", a collection of curiosities: live recordings, documentations of audio installations, odd unreleased projects and collaborations all downloadable free of charge in lossless FLAC format. Some recordings are 15 years old, others are relatively new. Besides Slava and Grundik the archive includes contributions from Victoria Hanna, Igor Krutogolov, Chaos As Shelter, Ant Weis, Leandro Barzabal, Jack Wright, Guillaume Viltard, Nori Jacoby, Maya Dunitz, Lev Bomstein and others. We hope you'll enjoy these sounds! Album: "Grundik+Slava and Victoria Hanna, live in Jerusalem, April 15, 2004"